Take your loved one away on a romantic break and forget about the world you are leaving behind, enjoying instead the relaxation in this cozy, clean, central apartment. THE PRICE ARE ALL INCLUSIVE : WIFI, A.C., CABLE TV, heating, courtesy mobile phone, maps, guides, linens, final cleaning. The visitor's tax of € 3,50 per person is not included. Children below 10 years no tax. 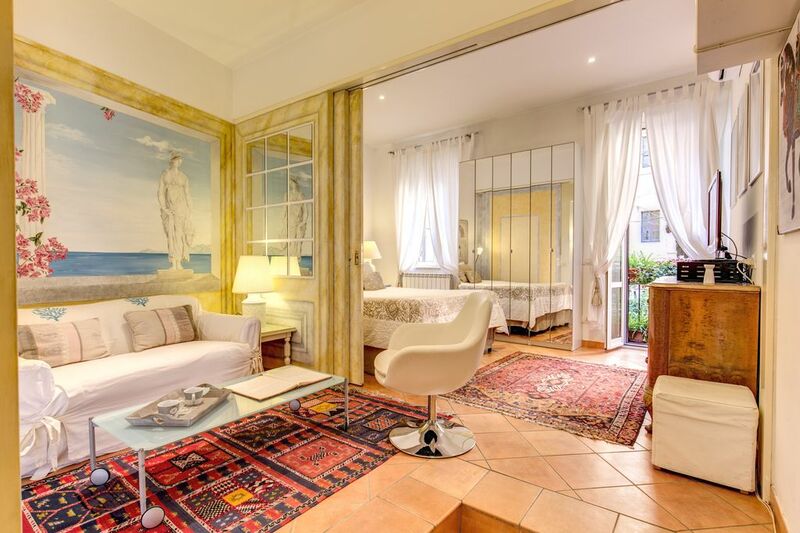 This romantic cozy apartment, perfect for an unforgettable honeymoon, is located near the Roman Forum and the Colosseum in the area called 'Monti', ancient neighborhood of the 'Suburra ' that still today maintains a popular and characteristic flavor, now considered the most trendy area of Rome. Don't forget to visit our other properties 394881, 250871, you will be able to understand how much we care about our guests reading all the reviews. See what the experts say about us: Slow Travel preferred, Best Rentals Award for years 2011/12/13/14/15,16,17,18. Recommended by "Dream of Italy", Top Vacation Rentals. 1 bedroom (very comfortable bed 170x200 cm) with a small balcony (smoking is allwed only in the balcony)that looks out on a green garden. With the greenery and freshness of the garden, you would never guess that you are in the historic center of Rome. The bedroom is separated from the living room by means of a sliding door. The door has been painted with tromp l'oeil effect by the owner and when opened forms, together with the decoration on the walls of the living room, gives an unique illusion. Going down three steps you enter the dining area, kitchen corner (refrigerator, microwave, electric stove, and everything needed for preparing your brakfast or light meals). Cable TV with international news (BBC, CNN) movies in English (when the original languages is English) and DVD. Free WIFI plus a cell. phone so you can very easily reach her at any time. At check in Natalia or Walter will personally welcome you and spend time to guide you in programming your vacation, sharing with you all their knowledge. You will have the feeling to meet a personal guide, that help you at 360' in discovering this big city so full of history, and save so much time that normally takes to a person that is in town for the first time. Transportation from and to the airport can be organized from Rome's Airports. We advise our guest to avoid bring heavy guide's book, we have anything you may need about Rome :Maps, tourist information, guides in english... If you don't have time to plan your vacation in Rome don't worry, at check in we will help you to organize each day of your stay with suggestion and indication of the best sites to visit. A FARMER MARKET take place every weekend near the apartment with a great selection of the freshest products of the soil, including also the best chees, best olive oil, best meet, salami, and olive - mushroom - eggplant - zucchini - artichoke patè ecc. ecc. Check in time at 1 p.m unless there has been a mutual agreementm, when possible we will be very happy to check you in earlier) NOT LATER than 8.00 p.m. (if you need a later check in please contact us before booking. Check out on the day of departue at 10 a.m. (unless there has been a mutual agreement). Natalia and Walter worked for Alitalia Airlines for more than 25 years. Natalia prior to work at Alitalia lived for more than a year in London, studying and working in a tourist agency. She speaks excellent English, understands and speaks Spanish and can 'get by' in French but also a real understanding of just what travellers need when they’re renting a short-term apartment in a foreign Country . Walter worked as well as pilot in Alitalia for more than 30 years, in the photo above you see Walter piloting Pope Giovanni Paolo II to Mozambico in 1988. They both attended courses of the History of Roman Art, which allowed them to get to know the city very well and they will share their knowledge with you at your arrival. At check in they will personally welcome you and spend time to guide you in programming your vacation. You will have the feeling to meet a personal guide, that help you at 360' in discovering this big city so full of history, and save so much time that normally takes to a person that is in town for the first time The twenty-five years Natalia spent traveling from one country to another gave her an opportunity to learn about the ways and customs of many countries and enhanced her natural predisposition for interpersonal relationships; she always succeeds in establishing an immediate, friendly relationship with her guests. Since 1995, Natalia attended the 'Academy of Decorative Arts', discovering a hidden talent for painting and decorating that she never imagined before. She now puts this talent to use personally decorating her apartments. In fact, the tiles in the kitchens and the tabletops in the dining areas of her apartments are all hand painted as well as the tromp l'oeil paintings, which gives each apartment a unique touch. LOCATION LOCATION LOCATION! The apartment is located next to the Roman Forum. The oldest and most important structures of the ancient city are located in the forum, including its ancient former royal residency the Regia and the surrounding complex of the Vestal virgins. The Old Republic had its formal Comitium there where the senate, as well as Republican government began. The forum served as a city square and central hub where the people of Rome gathered for justice, and faith. The forum was also the economic hub of the city and considered to be the center of the Republic and Empire. much more comfort compering with an hotel room, you can enjoy in this cozy nest meals, relax, 24 hours of English news or English movies, Internet, local mobile, but also have assistance from Natalia and Walter for any need, you will have the good feeling having friends looking after you in a stranger city. Kitchen (refrigerator, microwave, kitchen-range and everything needed for preparing your meals). The tiles in the kitchen as well as the dining tabletop have all been painted by hand, by the owner. a small balcony that looks out on a good sized garden and with the greenery and freshness of the garden, you would never guess that you are in the historic center of Rome. If we could give more than five stars we would, our stay was perfect!!! Our hosts, Walter and Natalia were outstanding, from arranging our transportation from and to the airport, to being there to greet us upon our arrival to the apartment. The time they spent with us orienting us to not only the apartment, but to our surroundings was very much appreciated. As the apartment sits in the heart of Rome, only minutes from the Colosseum and Forum areas, you couldn't be in a better location. There is no need for a car, as everything can be reached on foot, or by the Metro (right across the street). Restaurants are right outside the door as well as a grocery up stairs and across the street. If you like to live like a local when on holiday, this is the perfect place to do so. It was our home away from home for one week, and we could not have been more pleased. Thank you Walter and Natalia for allowing us to rent your lovely apartment and your hospitality. HI Carol, THANK YOU !!! for your nice review!! Walter and I appreciate it very much !! Happy to hear that you loved the apartment and also the Rione Monti, is my favorite part of Rome. You have been a fantastic guest and we hope to see you again in the future. The location is ideal and feels safe. The apartment is beautiful, comfortable, well-equipped and spotless. The owners are very helpful about all aspects of the visitor's stay. What more can one ask for! Thank you Ros, walter and I are very happy to hear that the apartment was perfect for your need. We absolutely loved the location of this apartment! Close to the metro station, hip shops and restaurants, and the Colosseum! The apartment was well-appointed, had windows facing both the street and the courtyard, but is not located on a noisy street. Several great bars, restaurants, and grocery stores are close by in the neighborhood. We had everything we needed to make our trip most enjoyable and would stay there again. Thank you Deb for letting us know that you had a good time in Rome and enjoyed our apartment. Unfortunately Walter and I didn't have the pleausure to meet you, we hope to meet you in your next vacation. We are sorry we could not meet you this time, but we hope to have you again as guest in your next trip to Italy. Although we didn't interact with Natalie, we found Walter to be an excellent communicator, with prompt, helpful email responses [Tip #3: take him up on his offer to arrange transportation to/from the airport -- besides being convenient, it eliminates the risk being an easy target for pickpockets while you're hauling your luggage through the train stations]. Their friend Stefanie was also helpful, meeting us at the apartment upon arrival to show us how everything works, make recommendations, and answer all our questions. She even gave us her phone # and showed us how to use WhatsApp, a preferred communication mechanism for Rome locals. We will definitely return to Rome (Trevi promised ;-), and when we do, we will ABSOLUTELY stay at this property again. Enthusiastic five stars! Thank you David for your nice review, you have explaned everything to our further guest: very good. Walter and I are very happy to hear that you had a good time, found our apartment very well located and also happy to hear that our friend Stephy did a great job. As you have mentioned (after coins in Trevi ) you will be back and we will be very happy to meet you. next to the apartment The Historical Museum of the Vatican City located in the Noble apartment of the Lateran Palace (admission from the atrium of the Basilica of St John Lateran. Complesso del Vittoriano: from the Terrazze delle Quadriglie enjoy a breath-taking view of the City of Rome. For your children: 3D Rewind Rome: a small technological jewel allows us to relive Imperial Rome with a virtual jounery in 3D bringing us back two thousand years. Time Elevator: Three large screen, mobile platforms simulating movement, and audio-video effects combine to re-create the history of Rome. Domus Romanae at Palazzo Valentini: the fascinating tour takes visitors through ther remains of the patrician 'Domus' and mosaics, painted walls, polychrome and paved floor can be admired thorugh multi_media reconstructions of the past involving light displays, sound effects and film showings.